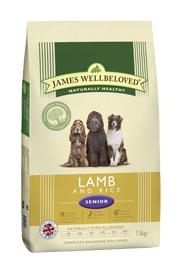 Ingredients: Rice, ground whole barley, lamb meat meal, whole linseed, lamb gravy, sugar beet pulp, lamb fat, alfalfa, natural seaweed, omega-3 and omega-6 supplement, sodium chloride, parsley, nettle, chicory extract, calcium carbonate, lysine, glucosamine, chondroitin, D,L-methionine, yucca extract, threonine, JWB special ingredients. Contains: Min 21% lamb, min 26% rice, min 14% barley, min 0.3% JW+. Typical analysis: Protein 18%, oil 8.5%, fibre 4.5%, ash 7%, omega-3 fatty acids 1.3%, omega-6 fatty acids 1.1%.